PT Garasindo Inter Global, car manufacturers Chrysler in Indonesia launched the new Wrangler and Patriot at FX Mall, Senayan, South Jakarta, today (2 / 5). Both models complement the all-new Grand Cherokee that was launched last March. The new Wrangler has better quality because it uses a new material. Then some of the convenience and safety features are offered, such as in between seats with warmers, panel audio controls on steering wheel, electronic stability control (ESC), Hill-Start Assist (HAS), Trailer-Sway Control (TSC), and Hill Descent Control (HDC). There are three variants of the Jeep Wrangler that was imported GIG for the Indonesian market, namely Sport, Sahara and Rubicon. All three machines use the 3.8-liter V6-powered 202 hp and 321 Nm of torque with a 4-speed automatic transmission. 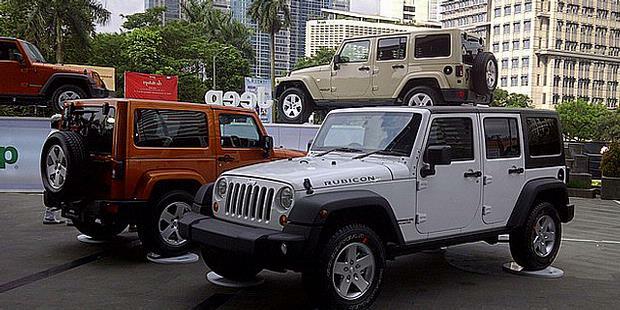 Wrangler priced starting Rp690 million to Rp875 million (on the road in Jakarta). While the New Patriot comes with a fresh new design, seen from the curve of her body is more oval design but do not leave the impression boxy. Patriot 4x4 2.4 liter engine equipped with World Engine that delivers power and torque 172hp 165 lb-ft. Transmission, 4-speed automatic generation Chrysler recognized CVT2 able to improve fuel economy by 6-8 percent compared to the older transmissions. This technology is able to increase the torque of the vehicle at all levels of acceleration to be more efficient. Sport Utility Vehicle (SUV) is offered in a single compact variant priced at Rp585 million on the road in Jakarta.